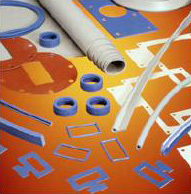 Niantic Seal has put together a complete line of products incorporating a wide range of performance materials to service expanding High Purity applications. Niantic Seal sales engineers can assist you in designing High Purity and Ultra Pure sealing solutions to be compliant to FDA, USP Class VI and NSF standards for critical components and processes. Whether you require high solvent resistant seals for diagnostic equipment, EMI shielding for Heart Monitor or simply a rubber stopper for laboratory equipment, Niantic technical sales can provide cost effective solutions.